Finally, what feels like a little clarity... Last Thursday, we retraced to the .618 Fibonacci of the 1292 to 1215 dip -- meaning, we recouped 61.8% of the drop from the 1292 high on 10/27 to the 1215 low on 11/1. The concept is that the market undergoes a series of failed breakout attempts that, upon the last turn, leads to a reversal. In a bearish Gartley, for instance, the market falls from X to A, then reverses -- retracing (recovering) 61.8% of the drop to B. The fact that it doesn't go any further is the first failure. It reverses and falls to C, which is typically 38.2 - 88.6% of the distance from A to B. The fact that it doesn't go any lower is the second failure and sets up the third reversal. 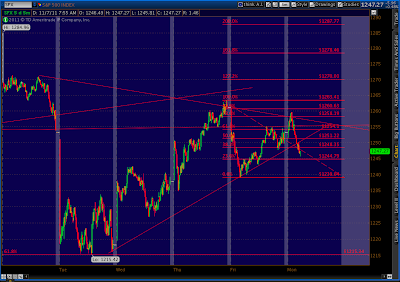 From C, the market heads up again to a level that, in a Gartley pattern, is 78.6% of the distance between X and A. It sounds confusing, but it's not. The percentages are based on Fibonacci numbers -- a very cool way of looking at the universe that dates back to ancient India (200 B.C.) but was "popularized" by Leonardo of Pisa (also known as Fibonacci) in 1202. Fibonacci numbers and the Golden (Phi) Ratio are endlessly fascinating, explaining such divergent designs as sunflowers, insect wings and the layout of Egyptian pyramids. Fibonacci numbers are instrumental to the construction of Harmonic Patterns, one of which is the Gartley. Other well-known patterns include the Bat, the Butterfly and the Crab -- each of which has its own set of targets for reversals. 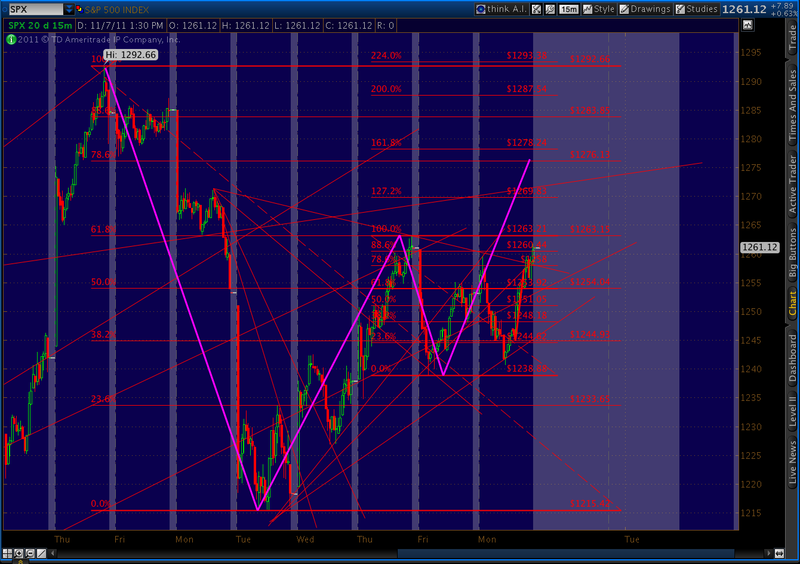 For a real life example of how effective a Gartley pattern can be, see the charts below. 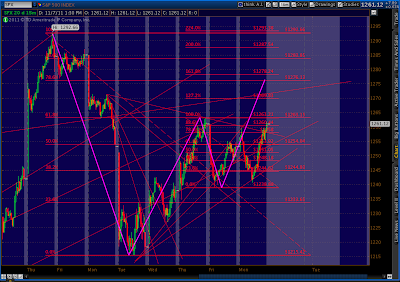 At 9:50 this morning, I noticed we had reached the .786 retrace of a several day old pattern. It called for a reversal at around 1258.01 and drop to the 1246 area. In fact, the market reversed at 1259.62 and fell to 1240.75 within the next 3 hours. This set up a very profitable trade. As mentioned above, we reached Point B at the .618 level last Thursday. 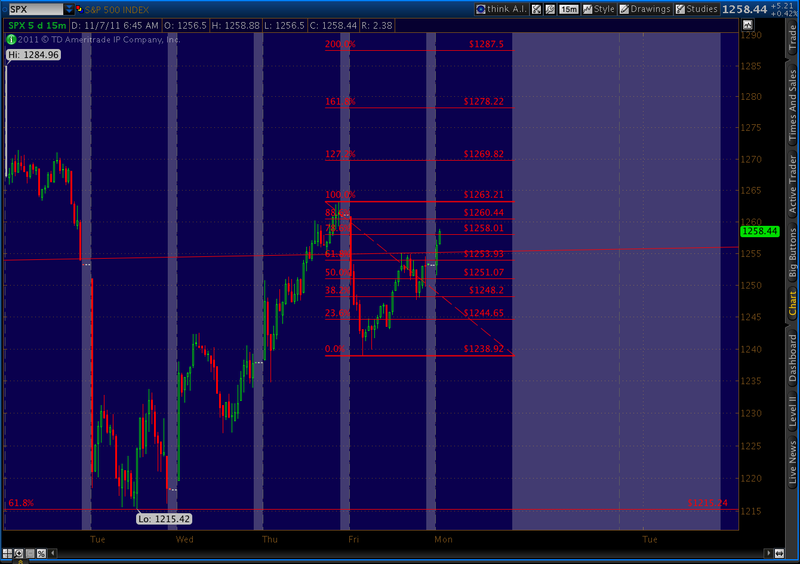 With today's drop to and reversal at 1240, we established Point C. All that's left is Point D at 1276.13. A reversal there could signal the end of wave (ii) and the commencement of the long-awaited, very aggressive (iii) of 3 down. BTW, as Dillzs99 points out, Gartley's sometimes "fail" to reverse at the .786 and become Crabs, extending out to the 1.618 level. 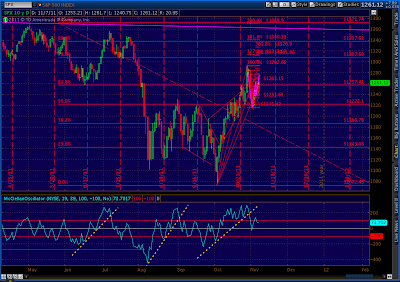 If this were to happen, the target for the larger pattern would be around 1340. This, of course, would mean 1292 was not "the" high for this pattern. So, which is it? My money is on 1276/1278. We already breached the 200 SMA (currently 1274) by 18 points with the 1292 high. In 2008, it was a 13-point breach. 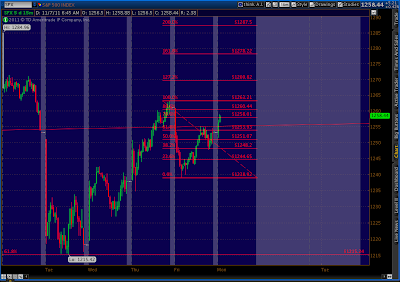 The 1292 peak was about a 70% retrace of the 1370 high; in 2008, the retrace was just shy of .618. And, I like the look of the daily RSI trend line (going back to Nov '10) which nicely accommodates the 1292 high, but probably wouldn't a 1340 high. The MACD also looks like it's very, very ripe for a roll. I also like the pattern that set up on the McClellan Oscillator. It closely resembles the well-developed, concave shape of the last two 100+ point plunges -- deviating nicely from its trend line and putting in no fewer than 6 peaks above the 200 line. In fact, the backtest the MCO just made argues for no higher prices at all, but it's not so precise that I would use to override the Harmonic forecast. 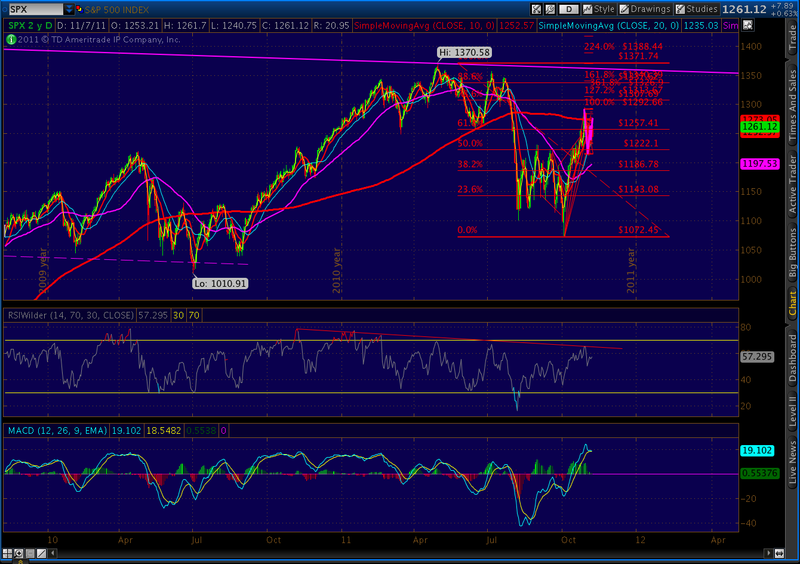 It's worth noting, however, that nearly every trip to the 295+ level has brought at least a 100-pt drop in the SPX. Last, I'm keeping an eye on the regression channel off the 2011 top. 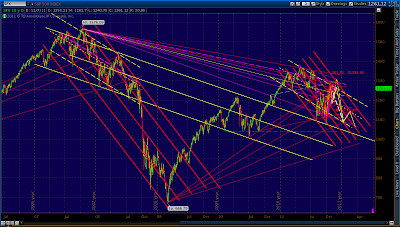 I've drawn it to be parallel to the 2007/8 top's, and thus far it's done a pretty good job of forecasting. It's shown here as the three yellow lines (with the dashed midline.) Tomorrow, it's around 1274, in the right neighborhood if my harmonic assumptions are right. This is admittedly an eye-balling kind of exercise, and is extremely sensitive to user (my) error. So, if we get our reversal at 1274-1278, what next? An initial 61.8% retracement (of the DA distance) would only get us back to 1238, still in the channel we've been in since Sep 22 if it happened tomorrow. We often see 1.272 or 1.618 reversals, though, meaning the move could take us as far as 1198 or 1178. First, let's see if we can take advantage of the 40+ point swing that should come our way over the next couple of days. Then, we'll see if this wave 2 is done, or extends out to early December as I pondered the other day. Haven't seen the news, but clearly some kind of juicy rumour just got the markets all excited. But, we're approaching the .786 and .886 at 1255-1258. 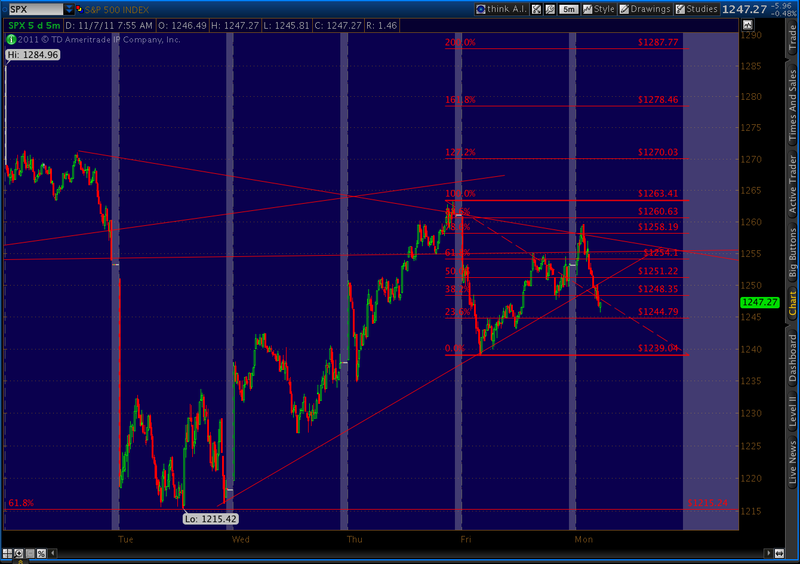 SPX completed a little Gartley pattern this morning, reaching the .786 Fib at 1258.01. Obvious divergence on the 5 min charts. 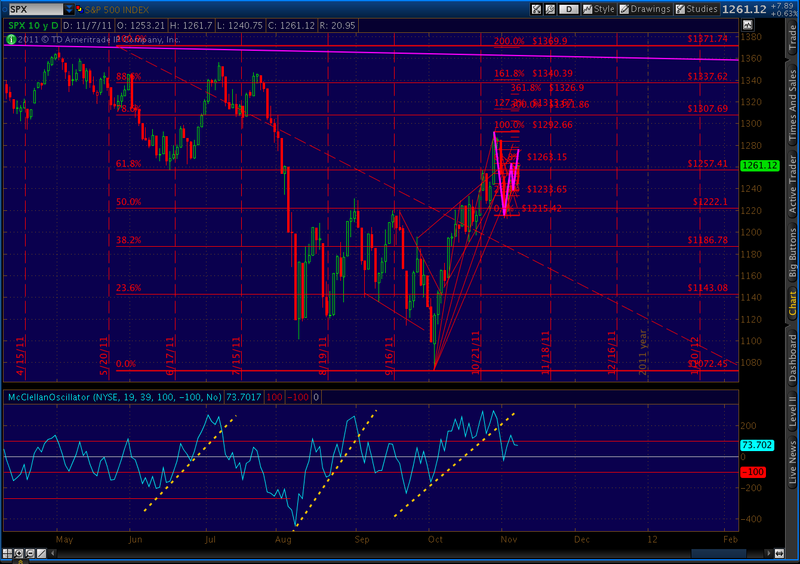 Look for a nice reversal to at least 1246. Pebble ... the intraday harmonics on SPX have been playing out very well the last few weeks and have been very profitable. The longer-term harmonics haven't (as of yet) been quiet as successful/profitable. I tend to agree. With the series of higher highs and higher lows we've had since 10/4, not a lot that can be inferred from harmonics -- which works better at signalling reversals based on failed breakouts. Hopefully the lower highs and lower low we've had this past week will present more opportunities. Pebble I think it needs to be noted, that Gartley's can easily extend into crabs and that would extend point D to the 1.618 level from point B. 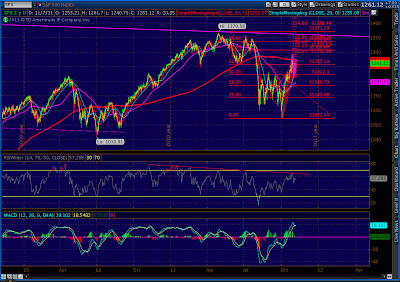 This would put SPX somewhere near 1340. This move would fit nicely into a good ole Santa Claus rally and pretty much detonate the heavy short interest that still persists. At that point, I think we may see the agressive reversal that we all have been anticipating. Thanks very much for the Gartley lesson. I find your posts very fascinating while keeping in mind that certainly anything can happen at any time. If you'll give us similar lessons on the Crab, Bat, and Butterfly you mention often on your blog, that would be highly appreciated. Yeah, that's something I've always wanted to do -- just haven't found the time yet. I've even toyed with the idea of putting together a little eBook devoted solely to harmonics. There is a lot out there, but I have yet to find a good, comprehensive guide. USD/JPY: How Low Can it Go?